So I'm going to say it right now: this is a Christian/Spiritual novel. So now some of you can run away, but for those of you who remain, do stay and sit awhile. In a nutshell: "Sleepless in Seattle" meets the Christian faith. For a Christian novel, this story and the characters really stuck to me. I found this book on Goodreads and started reading it via the Google Preview. I remember really, really liking it but for some reason, I didn't check it out until I raided my library system this past week. I'm so glad I picked it up. Even though I skimmed over some parts where it was thick with the Lord this, Him that, I still loved Elle and Heath's characters. It was a touching story and Rachel Hauck presented it so well, I felt myself cheering for Elle (especially during her victorious scene with Jer *wink*). I was nearing the end of the book and I found myself demanding, "Okay!! We know they're meant for each other! Let's get this show on the road already!" A sign of a good story when you cheer for the characters and are moved with them. One thing that surprised me (considering how good a book it was, content-wise), there were many grammar and editorial mistakes. Words wouldn't be spaced right and there would be a left out quotation mark (") confusing me. Still, I didn't let it distract from the story and it's a minor detail when I finished with it. I absolutely loved reading about these characters. Tracey-Love was so adorable and I loved the backdrop that she and Rio provided. 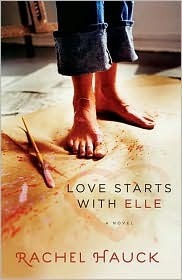 I loved reading about Elle's sister, Julianne, struggle with her own heavy secrets and shame. I was so glad when she got through them and everything worked out just fine and dandy. The summary make sit sound like the whole thing revolves around Elle's relationship with Jeremiah but it really isn't. It's about Heath and Elle and how they're dealing with their own inner demons. While I didn't grow up in the deep south, many of the phrases make me pang with longing for Kentucky. I really loved the southern humor and hospitality portrayed. Overall, a fantastic read. I was laughing and giddy at the end. This is a perfect summer read. Rachel Hauck is brilliant.